Since 2017, this pioneering industry forum has been exploring the evolution of payment cards and identity cards. 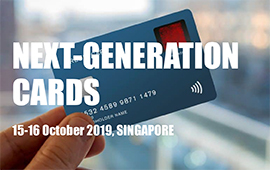 Issuers, payments schemes and industry experts from 10+ markets will discuss next-generation solutions and will continue to expand the payment card and identity card business. Transport Payments South Asia 2019 will provide unique opportunities for transport authorities, transit operators and banks to meet with industry experts to discuss the issues that are driving the transport payments business in South Asia today. How Asian markets are combining contactless payments, mobile proximity “Pays”, QR code-based mobile payments from banks, payment schemes, Internet giants and Fintechs to build new commerce ecosystems for online, in-store, in-app and face-to-face commerce. The largest gathering of National Government Authorities including Immigration, Identity, Border Control, Civil Registration, Customs, population management and other agencies with responsibilities in the area of Border and Identity Management in Asia. Attended by decision-makers from government and development agencies from over 50 government agencies from 42 countries. THE BEST opportunity to meet government delegates responsible for border management, secure documents and identity management in Asia! Engage with government officials from relevant authorities responsible for delivering public sector services and benefits to citizens and residents. The business mecca for experts in border and identity management. The only industry event covering all the opportunities for converting cash transactions to digital payments in the world’s fastest growing payments market. The only industry forum exploring the next evolution in the payment and identity card business. Issuers, card schemes and industry experts from 15+ markets discuss rapidly changing business and technology factors. The leading forum on latest developments and thought leadership in transport revenue collection and management in the Asia Pacific region. This year the conference shifts focus to helping stakeholders develop an implementation roadmap for 21st century transport payments. Asia’s largest gathering of card issuers and acquirers, domestic bank card networks, international payment systems, mobile payment companies and e-payment services providers that meet to explore best practices for driving the consumer payment. Asia's leading forum for transport revenue collection, transport data and information services, attended by transport operators, smart ticketing schemes, transport authorities and e-payment service providers. ID4Africa 2017 will be hosted by the Ministry of Home Affairs and Immigration (MHAI) of the Government of Namibia. The annual forum and expo focuses on digital identity and its application for driving socio-economic development in Africa. Improving retail CX, engaging customers through digital/mobile channels, integrating online payments, device-based commerce, mobile proximity payments, NFC & RFID in retail, the Internet of (retail & payment) things. With the opening of APSCA India we are launching a new forum focused specifically on the enormous and rapidly developing transport payments market in South Asia. The event will focus on the business and technology decisions for transport revenue collection. Innovate Finance & Payment Expo 2017 will focus on the latest in FinTech developments, secure payment innovations, successful business models for consumer payments and the future roadmap for innovative digital payments in Taiwan.